Toba Shinmei-sha (shrine), Toba, Hazu-cho, Hazu-gun, Aichi pref. 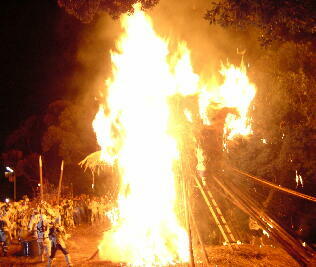 It is said that Toba-no-Himatsuri (Fire Festival of Toba) started approximately 1,200 years ago. Originaly this festival had been held on January 7th of the lunar calendar of each year as the New Year ceremony. People are formed themselves in two teams by the living area. The East area of the Toba River is called Kanchi and the West is calld Fukuchi. and every ceremony goes with them. 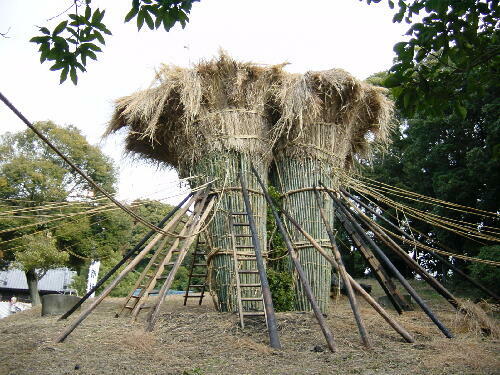 (Japanese pampas grass) and 60 fresh bamboos (61in a leap-year). natural kaya due to the destruction of the natural environment. It must be getting hard to keep up a tradition. are planted at the center of Toba Shinmeisha (shrine). 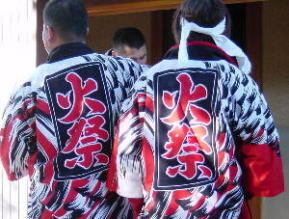 Shingi (a holy tree) are set inside of each toach (Suzumi), and the toaches are wrapped Juuninawa (twelve lopes which symbolize twelve months) are set. 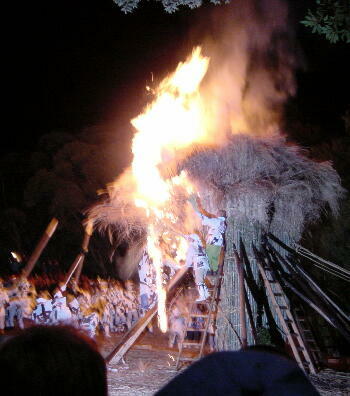 Once the toaches are kindled, participants of the two areas compete each other by how fast they take out the shingi from burnning suzumi. 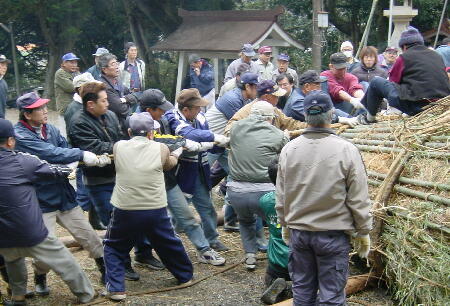 After they get the shingi, they offer them to the main shrine. and if Kanko (乾地: 乾 means dry) team won, they will have droughts or natural disasters. you will not get disease of teeth, and if you use them for sericulture, you will get big amount of silk,. though I don't know how to use them for sericulture. to the cold sea water in tow. 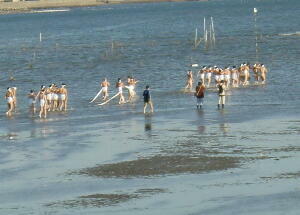 washed off from the rod of gohei. and go back to the shrine. 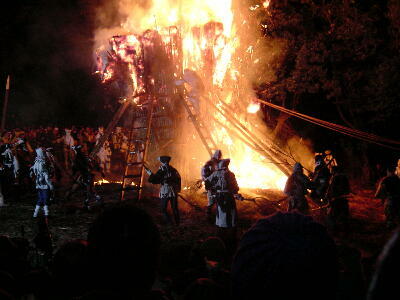 Local people read the burning "suzumi"
Get off at Mikawa-Toba Station on the Meitetsu Gamagouri line.